Because the glacier rises to 3,600 metres' altitude, Les 2 Alpes ski area is always guaranteed real snow - and with 425 hectares of marked pistes (10 hectares no groomed), it's pure bliss for snowsports-lovers. 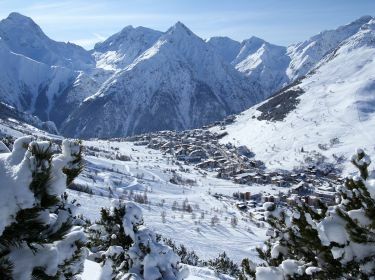 Its position high up in the Oisans mountain range makes Les 2 Alpes one of the highest skiable summits. One spectacular run starts from the glacier at 3,600 m and descends 2,300 m to the village of Mont de Lans at an altitude of 1,300 m - without skiers once needing to use a ski lift!